Good morning (or afternoon or evening, depending on where you are)! Today I have a review of two new gorgeous polishes from 6 Harts Polish! These were released a couple of months ago and, trust me, if you don't have them yet, you need them! Carnal Intent is a gorgeously juicy raspberry red filled with shimmer and holographic sparkle. I am really loving squishy polishes lately, and this one definitely fits the bill! It is just perfect for summer. The formula was great, no issues at all. I used two coats and one coat of top coat. Swimming Through the Deep Skies is, hands down, one of the most amazing blue polishes I own. If you know my polish likes and dislikes you probably assume Carnal Intent is my favorite of these two but, while it's stunning, Swimming Through the Deep Skies is my favorite. It is holo and glowy and it has an extra spark in the shade that makes it really special. 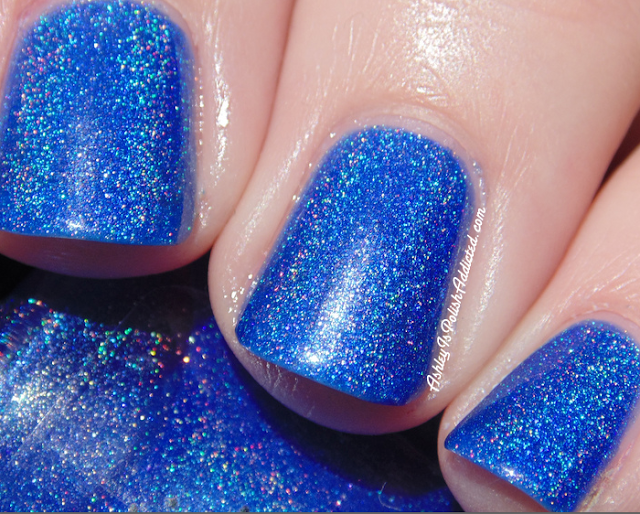 Plus this particular shade of blue is one of my favorites and pretty hard to find in nail polish! As a kid I loved the cerulean blue crayon, it was one of my favorites, and this reminds me of that exact shade. The formula was perfect. I used two coats and no top coat for the photos. Check 6 Harts out at the links below! OMG! I NEED THESE, yes... Caps was necessary! Yahhhhssss I need these too!!!! The blue looks absolutely stunning!